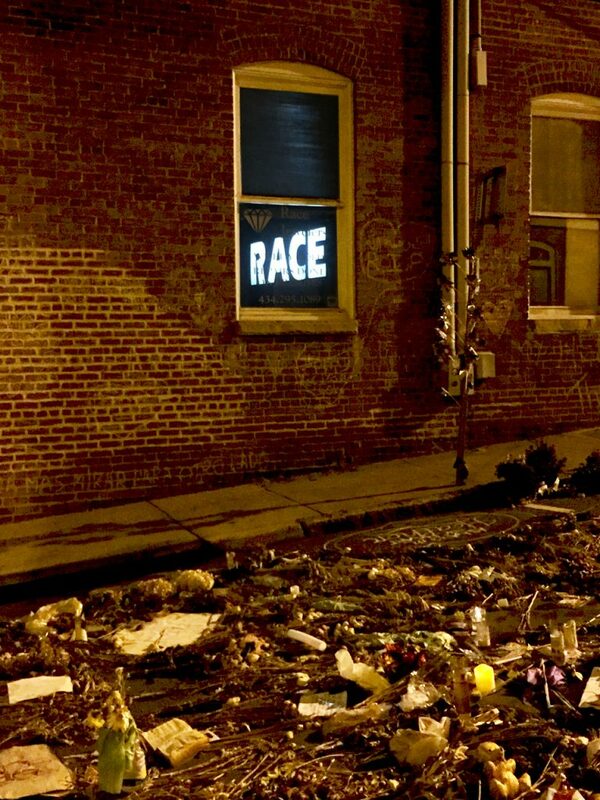 The Summer of 2017 will probably be remembered as a Summer of Racism… at least from the mass media’s point of view. In my little town of Charlottesville, Virginia, it really began brewing in the Spring after our City Council voted to remove two Confederate war statues from a couple of parks downtown. That decision was soon put on hiatus for 6 months by the court system, but at the same time City Council also voted to rename the two parks from Jackson & Lee to Justice & Emancipation respectively, and that decision was put into place right away. On the 13th of May, a rally (unofficially sponsored by Tiki Brand torches) took place in Lee/Emancipation Park (or Leemancipation Park for short). This was a precursor of the Alt-Right Jamboree on the 12th of August where White Supremacists (mostly out-of-towners) and Antifa (probably also mostly non-locals) politely exchanged business cards and agreed to meet up for drinks to hash through their differences and better understand each other… I mean, beat on, screamed at, and pepper-sprayed each other while Police in riot gear watched from a distance and helped clean up the mess after the melee was over. And of course, both of those racist events were the crusty slices of stale bread on each side of our KKK sandwich. Back on the 8th of July, the Loyal White Knights of the Ku Klux Klan came to town for their protest in Jackson/Justice Park (or Jackson4Justice Park). I attended both the KKK rally and the Alt-Right fiasco with a camera on my shoulder to document these moments of Charlottesville’s history and from my perspective the KKK rally was a walk in the park compared to the Alt-Right/Antifa mess. 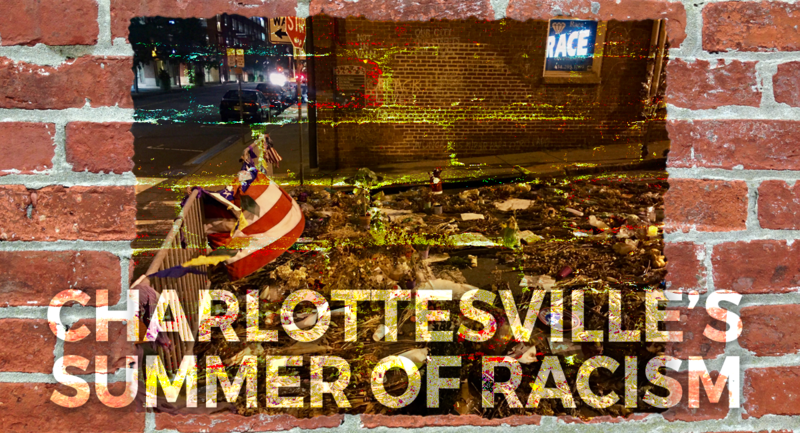 So that’s been Charlottesville’s Summer of Racism (the 2017 edition). 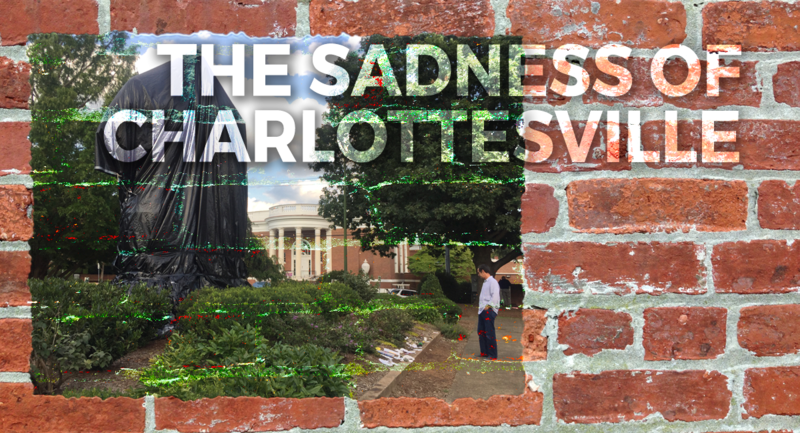 It’s clear that White Supremacy exists and at these rallies they get their chance to come to our town and bang their drum, but all of the rallies, City Council meetings, and discussions about racism has made me wonder… what does racism really look like on a normal day in Charlottesville? Not when people come to town to argue over statues and spread their hate, but what does racism look like on a day-to-day basis here? The community memorial in memory of Heather Heyer on Fourth Street in Charlottesville. The Race Jewelers sign glows through the window from their store located on the corner of Fourth Street SE and Water Street. For the last six months or so I’ve been asking my friends and colleagues where they see racism in action… not the racism you hear about on the news, not the systemic racism that effects our society but often makes me feel helpless to try to change, not the racism that a friend told you a story about, but the racism that you personally witness, experience, or even may participate in. As I’ve asked this question, I’ve seen the looks on my friends faces as they think about the question; white faces, black faces, and others. And you know what? The silence I’ve heard in response is very interesting. Some of those I’ve asked jump right in with a story of racism they heard about in Chicago or some other city. Their example is about racism “out there”, which I don’t deny exists, but I try to pull them back to their own lives and direct experiences with racism. Often that’s when the crickets begin chirping. Not that racism doesn’t exist, we all know it does, but it just doesn’t often occur in their day-to-day experiences. Now I’m the first to admit that the few friends I’ve had this conversation with in no way constitutes a scientific sampling. I also admit that my circle is relatively small; the company I run only has a handful of employees, the church I attend is cozy, yet somewhat diverse, the paths I walk are often off the beaten path. So that’s why I want to bring this up here… to broaden it out and to hear from you about your own up-close experiences with racism. How have you seen it? What does it look and feel like? If you have a story to share, I ask that you please respectfully share it so that each of us can benefit from your personal experience. I’ll close with an interesting story dealing with race. Last month I spent a couple days with a new black friend of mine. We were able to share several meals together and spent a lot of time just hanging out and getting to know each other. As we ate, he told me about an important meeting he had just wrapped up with another African-American man. During the meeting, the man pulled him aside and said, “I’m glad you’re one of us!”, meaning, “I’m glad you’re black like us!” As my friend retold the event and let those words sink in, he shook his head in silence. We’ve come a long way since the slaves were freed following the Civil War. We’ve come along way since Martin Luther King, Jr. walked across the bridge in Selma. And someday, maybe we’ll say we’ve come a long way since Charlottesville… but until then, no matter how far we’ve come, it often seems like we’ve barely taken a step.